Rent villas and houses in Sunset Lakes, Florida with private pools. Large lakefront villa with South facing pool, 4 bedrooms ( 2 huge master bedrooms ) very modern decor, Our villa will make your vacation special. AMAZING LAKE VIEWS !!! UPSCALE LAKE FRONT VILLA 4 BED/3 BATH WITH POOL/SPA. Enjoy our beautiful pool home located in Sunset Lakes, a private gated community within less than 12 minutes of Disney. 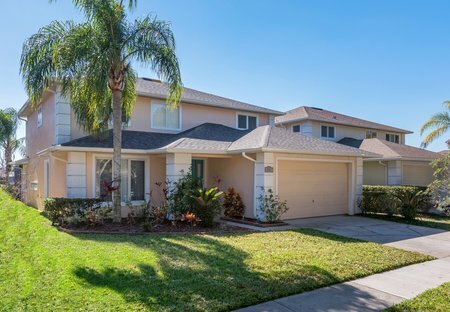 Luxury 4 bedroom, 3 bathroom villa, in quiet gated community, yet only 5 mins from Disney! Private screened south facing pool with stunning lake view!! Games room+AC..new TV /DVD combos all bedrooms! Sunset Lakes, 4 Bed, 3.5 Bath, Pool & Spa overlooking lake. Master Bedroom & Ensuite. Double room & Ensuite. Two Twins (one themed). Seperate Bathroom. Lounge. Dining Area. Wi-Fi & Cable. A/C. Garage. Luxury 4 bed 3 bath villa with pool and games room situated on the prestigious gated community of Sunset Lakes, less than 10 minutes from Disney World!